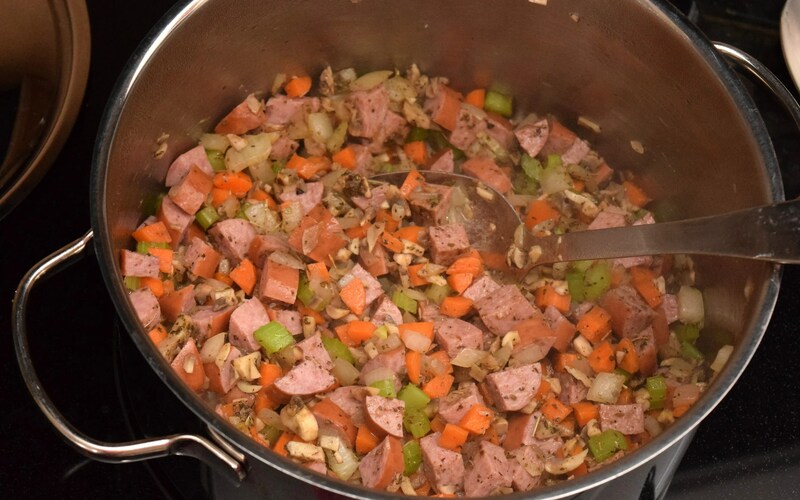 For me, nothing makes a house a home like a large pot of homemade soup simmering on the stove. In the winter, I make soup at least once a week, and lucky for me my family loves it. One of the problems with canned soup is the large amounts of sodium in each can. It actually made headlines a couple of years ago when one of the big soup makers vowed to reduce sodium in their soups but ended up adding even more sodium. Folks love their salt. While I firmly believe salt enhances favor, I think, especially in processed food, the salt ends up being the only flavor! When making soup, if I am using canned items, I always try to find the low or no sodium options. 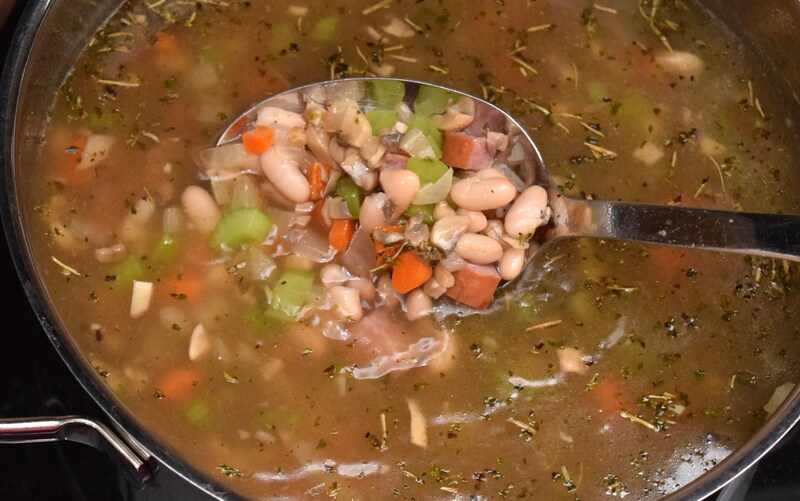 Things like beans or even chicken stock can have so much sodium that your homemade soup ends up having as much sodium as the canned variety. It’s important to read the labels on what you buy. 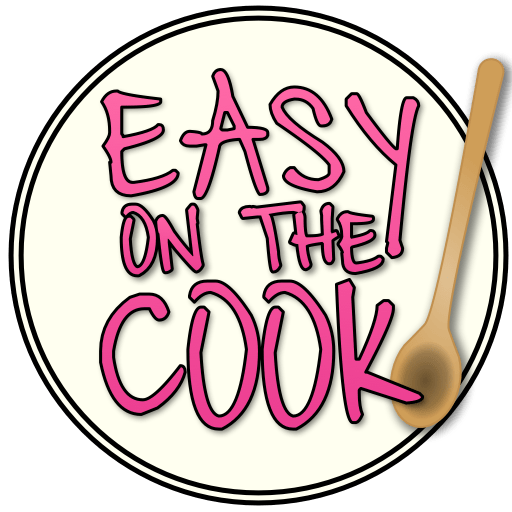 It only takes a few minutes to ensure your hard work in the kitchen will not only taste good but be good for your family too! Ok, I’ll get down off my soap box now and get back to the soup! The soup starts the traditional way, by sauteing the veggies. Chef’s call this “sweating” the veggies. Helps to release the flavor before adding the stock. I usually add the veggies one at a time; when the veggie starts to become soft or translucent and most importantly becomes fragrant, I add the next veggie! When the veggies are ready (in about five minutes) I add the sausage and dried herbs. If you want to use fresh herbs, add them in the last 10 minutes of cooking. I like to use fresh herbs because it gives the soup a bright note (look at me sounding all foodie like), but I don’t always have them on hand. 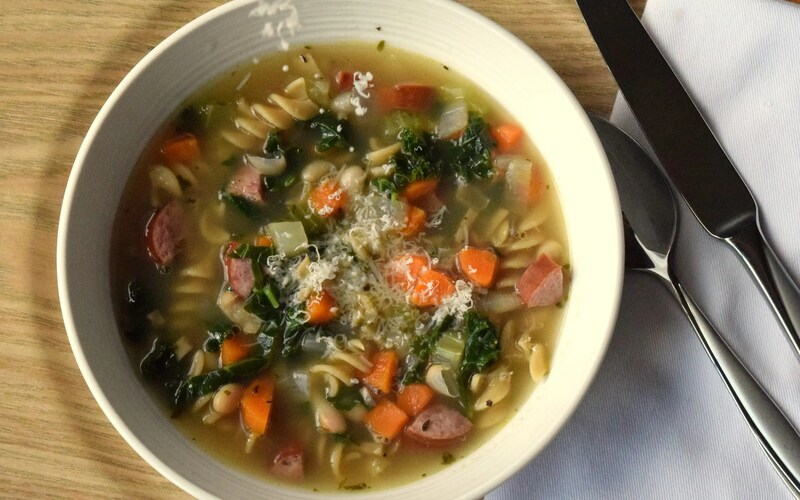 About 12 minutes before you want to serve the soup, add the Kale and the pasta. If you’re like me and don’t like soggy pasta in left over homemade soup, you can always cook the pasta separately and just add it to your soup when you reheat it. I have started in the last couple of years using kale almost every time I would use spinach or parsley in a recipe. It holds up well and packs a very good nutritional punch! When the pasta is finished serve your beautiful and delicious soup! It’s also good with a sprinkle of Parmesan . 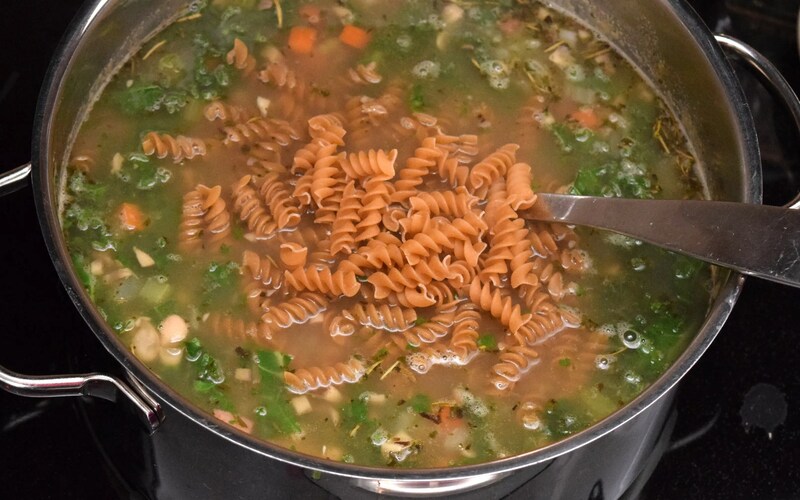 This delicious and healthy soup is simple to make and a family favorite. Yield: At least 6-8 servings. In a large soup pot heat the olive oil over medium heat. Add onions and saute for about 2 minutes until onions are becoming translucent and fragrant. 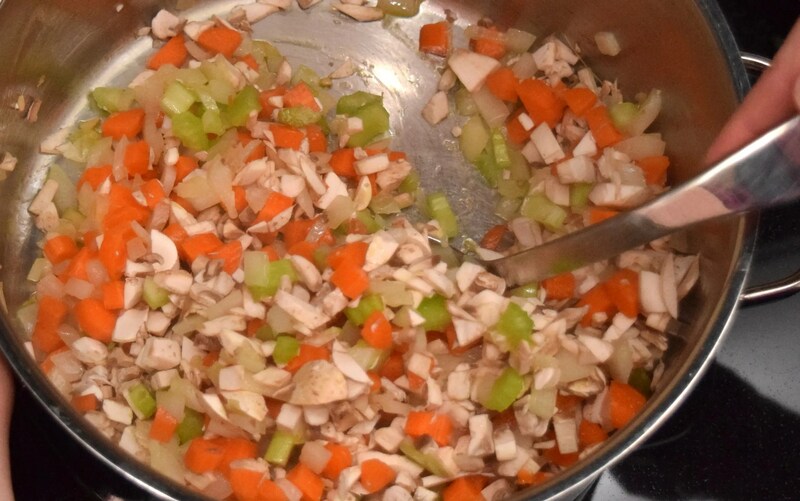 Add carrots, cook for about a minute, then add celery and cook for another minute. Add mushrooms and cook for another 3-4 minutes until mushrooms are soft. If you are using dried herbs add them now. Next add turkey sausage and saute for about a minute. Add in beans, then chicken broth. Simmer, without boiling, for 15 -20 minutes. About 12 minutes before serving add in kale, and pasta. If you are using fresh finely chopped herbs, add them in now. Taste broth and add salt and pepper as needed. This looks delicious! Perfect for this snow storm we’re bracing for on the East Coast! This sounds wonderful. Can’t wait to try it ! I hope you enjoy it! I just made it again last night and I used some new pasta I found that isn’t made of wheat but Quinoa instead! It was very tasty!